This nautical style nightstand is the perfect solution for bedside storage. The drawer draws focus with the rope handle, a perfect touch additional to any coastal style room. Thanks to it's versatility, this dresser will pair will with any traditional or contemporary furniture or design theme in any bedroom of your home. Featuring metal slides on each side for quick and smooth use, accessing your belongings is a breeze. The 1 spacious drawer is perfect for storing glasses, lotion, or a journal, making it a great fit for any bedroom in your home. Tidy up your space in style with the Aviron collection! NAUTICAL CHARM: Featuring a rope drawer handle, this stylish dresser will add coastal flair to any room. 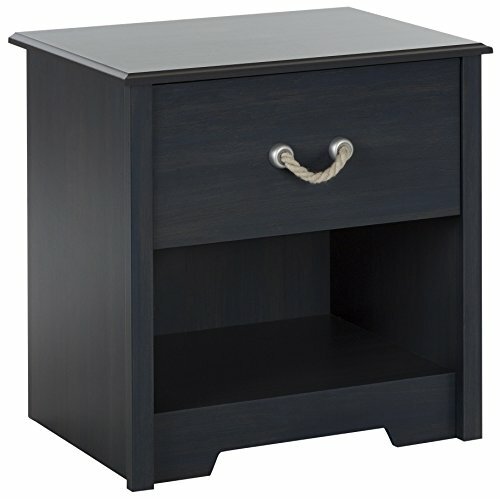 STYLISH STORAGE: With 1 spacious drawer, gliding smoothly on metal slides, and open storage below, you'll stay organized and tidy with this nightstand. PERFECT FOR ANY ROOM: Whether you're looking for a small end table or nightstand in the bedroom, this charming nightstand will fit in anywhere in your home.